Set in stunning countryside, the Coach House is a great base, with purpose made facilities for fishermen, walkers, cyclists and other outdoor sports people. It is used regularly by the Scottish Junior Cycling Team. Some guests never leave the place - they just like sitting in the sunshine, glass in hand, enjoying the company of friends and the tranquility of Durhamhill while their offspring run amok, jumping in puddles, kicking a football or batting a cricket ball, maybe pitching a tent in the garden, cuddling llamas, feeding the hens, finding eggs, perhaps having a spin up and down the drive in a motorcycle sidecar or helping Alan to build a bonfire - they generally get very muddy and there is usually a lot of laughter. If the weather is poor, everyone can gather in the big games room for a rowdy tournament - table tennis, table football, air hockey or chess and then light the woodburner and convert the games room into a cinema, munching popcorn freshly popped in the microwave. 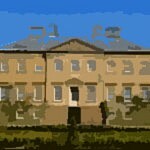 Enthusiastic musicians may be invited into the main house to try out Alan's drum kit or play along with their guitars. 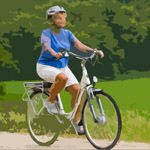 Customers can either hire a bike from our base in Parton (near Loch Ken) and return it at the end of the day, or we offer a deliver and collect service (a small delivery charge will apply). They have full public liability insurance and the bikes are checked and maintained by them after each hire, and serviced by Next Level Bikes in Castle Douglas. Please phone us if you have any enquiries or would like more information. With the longest zip-wire in Scotland, Laggan Outdoors offers excitement in many forms for older children and brave adults. Try bouncing down a hill in a big rubber ball, grass surfing, archery, clay pegeon shooting or even an obstacle course for a blindfolded driver with a back to front steering landrover and a team of navigators all desperate to beat the other team. It is advised to book in advance and prices are cheaper for group bookings of each activity. This has been voted the most popular place for small children and sweet-toothed parents. Children can make their own giant chocolate rabbit or train, and lollypops too. There is also a play area and cafe. Alan has two motorbikes with sidecars and we offer short trips for children or bigger tours for intrepid adventurers, seeing many special places and lasting as many hours as requested, possibly with a picnic or fishing stop included. This is Juliet's favorite walk. Henry Moore statues are set in beautiful countryside locations. 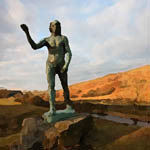 The short drive to Glenkiln, from Durhamhill, is lovely, and the statues are not all easily found, which adds to the fun. Take some extra clothes in winter for the poor naked man by the roadside. Once you have tracked down all the statues, drive over the hills for a warm welcome and delicious meal in the Green Tea Room at the village of Moniaive. 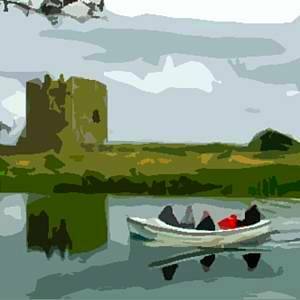 This beautiful old semi-ruined castle, built by the fearsome Black Douglas, perches on a grassy island. Visitors need to walk a short distance past fields and then ring a bell to call the ferryman. If lucky, the ferryman might take you to explore a section of the river before crossing to the castle. Remember to take a picnic and a torch to see if there are any prisoners in the dark, scary dungeon. 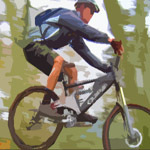 Mountain biking has something for everyone - from easy woodland rides to the exhilaration of a downhill trail. It's a great way to keep fit and at the 7stanes you can enjoy some of Scotland's fine forest scenery at the same time. Mountain biking can be enjoyed by the whole family and at the 7stanes we have trails to cater for all ages and all abilities. If you're new to the sport, we've provided some information below to help you get started. Near Borgue, one of the many great sandy beach on the Solway, next to gentle countryside, is fantastic for families and fun. On sunny days it is one of the best places in the world. Take a canoe, windsurfer, kite, boules and frisbie as well as swimming togs. 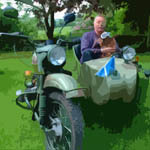 This is Alan’s favourite place to go fishing, with his motorbike and sidecar. Situated up a forest path, starting near Laurieston, this is a great place for rugged people who enjoy wild scenery and, being windswept and soaked. 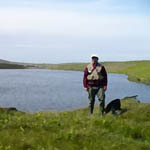 Take fishing rod (& permit - ask Alan), camera, waterproofs, hot water bottle and Bombay Mix. If a thunderstorm comes, there is a fishing hut to huddle in, munching Bombay Mix and reading previous visitors’ extreme fishing tales. 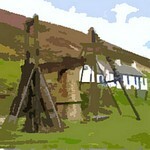 Based in Wanlockhead, is open from Easter to September and offers a fascinating insight into the hard lives endured by the villagers of the past. Visitors can go underground on a guided tour of Lochnell mine. A beam engine in the village, used to extract water from the mine workings is the last surviving example of its kind in Britain. The museum has a cafe and shop. 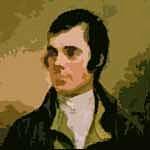 When Robert Burns was 29 and at the peak of his powers as a poet, he took over the farm at Ellisland. He lived here with Jean Armour between 1788 and 1791. The farmhouse provides a fascinating insight into the farmer-poet's life and offers the opportunity to view a range of his possessions. 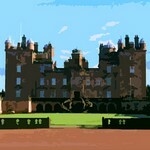 Dumfries House is one of Britain’s most beautiful stately homes and best kept heritage secrets. With its sumptuous interiors and magnificent furnishings, all set in two thousand acres of land, there is something to delight and enchant visitors of all ages. Built between 1754 and 1759 for the 5th Earl of Dumfries, and with a unique collection of Chippendale furniture, the House has been described as an 18th century time-capsule since the principal rooms and their contents have remained virtually unchanged for 250 years. 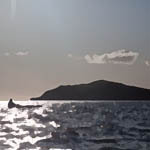 The course is situated on the Solway coast giving panoramic views of the Solway Firth, the Cumbrian Lake District to the south, and the Galloway Hills to the west. 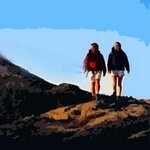 The terrain is level allowing for easy walking with no hills to climb. Being totally remote from large centres of population a feeling of being well away from the rat race is engendered. 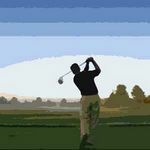 This feeling is enhanced by the course design which means that players are seldom aware of others on the course. Lovely small town close by that is a thriving market town, on the edge of the town sits Carlingwark Loch and the Lochside Theatre. 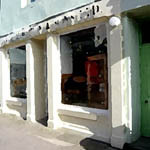 The centre has a high street full of individual small shops and boutiques. Known as the regions food town, not for the restaurants but more for the fact that there are over 50 local businesses that make organic and wholesome local produce.